I came upon this one a very random manner. What do you suppose they are staring at? A plane overhead. A sudden shadow. What Steve sees when he looks up turns his face bug-eyed and gape mouthed. Sasha looks at Steve in this cartoon pose, and has the absurd thought that there should be exclamations points hovering above his head. Something falling from sky: blue, glistening through the fog, streaking like a meteor, crashing through the Jeep’s open roof, landing squarely on Steve’s head, turning his cartoonish face into a mess of blood and brain. Blue ice. Frozen waste. Should have put the top on. It wasn’t bad enough that he’d had to leave Florida. He loved his wife, but he’d never understand why she wanted to stay in Minnesota. No, the worst part was her bizarre family. Every year, the bloody cheerful lutherans all packed into their jeeps to caravan to Duluth. And this year, since Mary was eight months pregnant, he was driving. "Lead us out of town, Bob!" they said. Sure, put the southern boy in front. Gleeful bastards. He opened the door and leaned out. "Stop singing that stupid 'over the river and through the woods' song and help me push!" He'd said it, over and over he'd said it. One day the glacier was gonna crack. And today it had. Charlie looked at the crowd gathered around him with malice in his eye. "You dumb bastards. It's not like I ain't been telling ya for ten years. This was a bad idea from the start." Charlie looked back to the hillside, hoping that the frozen monster inside would just stay put. "It took fifteen days, three tanks, and Holiday's elephant gun to get it holed up in there. Why didn't you bastards pour concrete or something?" The four-wheelers, out to enjoy the last snows of the season on the peaks of Colorado, eased to a halt, vehicles on both sides of the road. 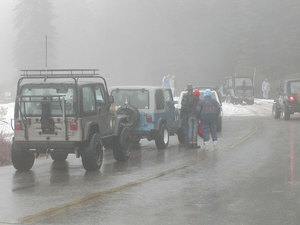 Drivers and passengers got out, gawking at the bloody mess in the road near the lead Jeep. "My God, what is it?" "How horrible... Is that an arm?" The sounds of retching off the side of the road. One driver, more courageous than the others, walked over carefully and gingerly poked the finned carcass with a stick. "It's real, all right," he announced. "It's really gonna be a bad year for shark attacks."